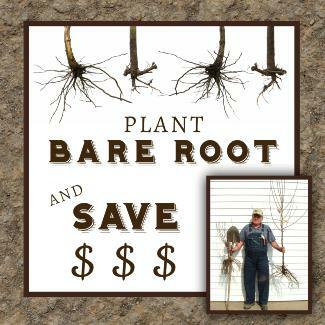 Plant Bare Root – Nelson Nursery, Inc. ECONOMICAL – Since they have no pot or dirt we can sell them at a REDUCED PRICE. LESS TRANSPLANT STRESS. Bare Root trees and plants are harvested after they are in their dormant “sleeping” state. This greatly decreases the shock to the plants. CORRECT PLANTING DEPTH IS EASIER to gauge. Planting depth is critical for all plants and when not done correctly can result in the plant not surviving. With the graft and primary roots clearly visible, precise planting depth is more easily accomplished. MORE EFFICIENT WATER ABSORPTION. Bare root plants have up to 200% MORE ROOTS. Potted trees need their roots trimmed prior to potting and transporting. More roots mean more efficient water absorption. VISIBLE ROOTS will allow you to see if they’ve been damaged or have an unnatural growth pattern. Corrections can be made before planting to encourage FASTER GROWTH and keep the tree in OPTIMUM HEALTH. EARLY PLANTING. Since they are in a dormant “sleeping” state, they can be planted as soon as the ground thaws. EASY TO TRANSPORT in your vehicle as it can lay flat. Choose from HARDY MINNESOTA STOCK.